Caramel, roasted, black and chocolate malts provide an explosion of coffee like flavors. The strong espresso character comes from the addition of espresso beans to the boil. Notes of vanilla, dark fruit , cocao and chocolate. 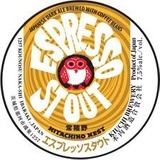 The very unusual character of Hitachino Nest Espresso Stout stems from the fact that Kiuchi Brewery is using the recipe of a Russian Imperial Stout as base. Pitch black color, big brown head. Aromas of chocolate, roasted bitterness, black currants, dark fruits.